But what about the center core? 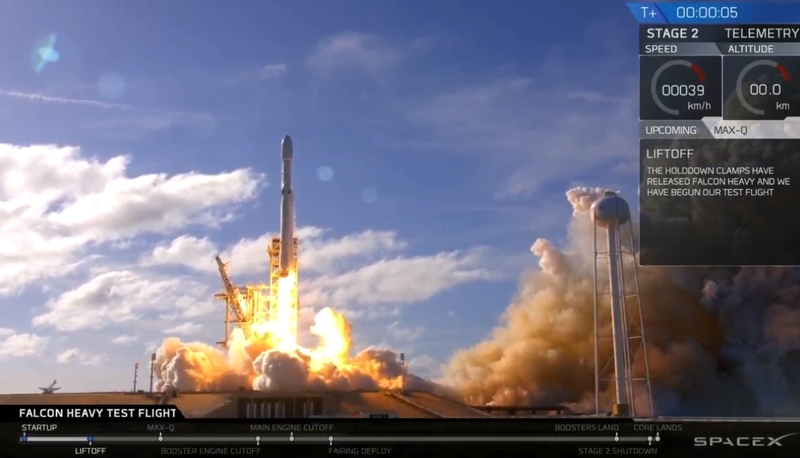 SpaceX on Tuesday launched its Falcon Heavy rocket for the first time. The test flight has been highly anticipated for months and following some delays due to weather, the massive rocket blasted off without incident to begin an extended orbit around the Sun. SpaceX conducted a static test fire of Falcon Heavy in January, firing up all 27 Merlin engines in preparation for an actual launch. Seeing as today’s launch is merely a test, Falcon Heavy wasn’t carrying a commercial payload (the company often shuttles supplies to the International Space Agency or puts satellites into orbit for paying customers). Instead, the company elected to strap Elon Musk’s Tesla Roadster on the rocket and send it on a journey that could last for nearly a billion years. You know, just for fun. Behind the wheel of the Tesla is none other than “Starman,” a dummy decked out in SpaceX’s own space suit. The driver is named after a song by David Bowie, also called Starman. How cool is that? Impressively enough, SpaceX even managed to simultaneously land both boosters on solid ground. As for the rocket's core, well, it's fate remains unknown at this time (nearly 30 minutes after launch). The core was supposed to land on a drone ship in the Atlantic but the barge's camera feed cut out right as it was approaching. Conveniently enough, SpaceX's livestream ended before the core's fate was shared, sending onlookers into a mild state of panic.